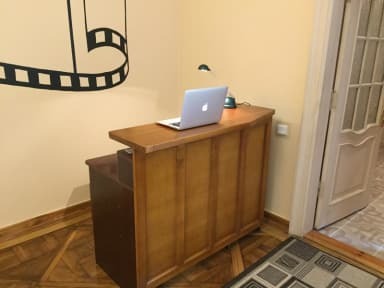 Cinema Hostel is a spacious and cosy accommodation in the city centre in 5 min to Rynok Square (the main square of Lviv). It is close to restaurants and dining, nightlife, and public transport. You’ll love our place because of the atmosphere and neighborhood. Cinema Hostel is in the city centre and in 5 min to Rynok Square (the main square of Lviv). It is set in the very centre so it is close to restaurants and dining, nightlife and public transport. Modern fully renovated hostel located in a walking proximity from the main street with a parking lot next to the house. It is a great choice for a group of 14 people. You can enjoy a fully equipped kitchen (TV set, microwave, fridge, cups, plates, cutlery etc.) with common dining area, 2 separate rooms. The hostel has a very good public transport connection to the railway station, airport, stadium Arena Lviv. For your convenience we offer Wi-Fi, DSTV, laundry washer, soap,shampoo and fresh towels. It's a laid back place in a great location with great facilities. Taras is one of the nicest owners I've met and you'll probably find out about some movies you've never heard of through him! It's a very nice place, right in the middle of the city. The people are friendly. Lovely, small hostel. The other guests were friendly and the owner (the only staff member!!!) was incredibly nice and eager to share his passion for film. Cool place to kick back and watch a movie, or learn about film from the various books, or try tea made from herbs collected by the staff. I had a 1AM train ride after I checked out, and they let me stay all night for free because there was extra space. Only 14 beds, suited for laid back travelers. Comfortable and beautiful, worth the money. A small hostel that feels more like home. The hostel is run by the owner himself mainly and he is a nice guy. There is only two rooms with beds and mainly one bathroom for showering which was the only slight negative part. Otherwise this place is great if you are looking for peace and quiet and non party atmosphere. Lovey hostel, owner is a brilliant host and his teas are very nice too. Great location, comfortable beds and great value for money. A small, quiet family run hostel, really close to the Old Town of Lviv. Beds are super comfortable and Taras is really helpful and friendly. There are only about 14 beds in the hostel though, so it is very small and caters to an older crowd, so not the best place to meet people. 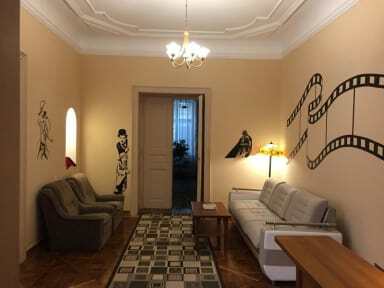 Very good hostel in Lviv, located in a nice area between the old centre and the university. The beds were comfortable and there was a cozy atmosphere at the hostel in general. The owner is very nice and helpful, and has many cool films to watch after you come back tired from a day of sightseeing! Really cool place and the owner is a great guy. I had a train at 10pm on the last day and he didn't charge me anything extra to continue using the dorm and to hang out in the lounge area right up until I had to leave. You can see his passion for the place and will go out of his way to help you. The hostel itself definitely goes all the way with the movie theme and there will usually be a film playing on the TV. I got the sense it was an older crowd but that can be nice sometimes. Very noisy. You won't get sleep at night. Only one shower for 14 people. But great location and comfortable large bed. Free washing machine.